After almost 11 years after it originally opened, We Will Rock You is one of London’s longest running musicals to date. Receiving mostly bad reviews when it first opened back in 2002 it’s proved to be an audience favourite and still rocks the Dominion Theatre night after night. Over the years since its original premier its had loads of productions open all over the world; places include Australia, Japan, Las Vegas, Spain, Germany, Canada, Italy, Norway and plenty of other places with a 10th Anniversary Arena Tour opening at the end of February. 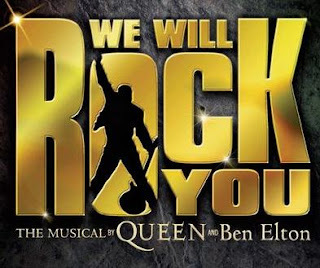 We Will Rock You follows the story of Scaramouche and Galileo who are outcasts in a world where clones are produced, music is made by computers and all the GaGa kids watch the same thing and learn the same moves. Meat and Brit (two ‘bohemians’) find Galileo and Scaramouche and take them to the heartbreak hotel but they get found out by Khashoggi who is the right hand man to the leader of the iPlanet, the Killer Queen. In the end they find an electric guitar and find real rock music and save the world. Not going to lie, the plot is awful. Ben Elton must have been on something when he was writing this as it’s just weird and at times just stupid. I’ve seen the show quite a few times over the past few years and I noticed he’s made a lot of changes to the script, this obviously has to be done because they makes references to modern things but he’s gone way too far and added extra dialog which is just silly and seems like something they’d say on a Cbeebies TV show. Like for example this new monologue about the Killer Queen being half woman and half pixelated... I mean WHAT?! Even though the book is just terrible Ben Elton has created a show where you really don’t care about the characters or the story and you are able to just sit back and enjoy your night. And that’s exactly what you do when you go to this show. Ben Eltons and Arlene Phillips direction is also very mediocre, nothing special or imaginative but I’m guessing they knew people who would be seeing the show wouldn’t care about that kind of stuff anyway! However Arlene Phillips choreography is brilliant in the show and is still as fresh as it was 10 years ago thanks to resident Choreographer Giorgia Barberi. The music is the best thing about this show, obviously the Queen songs used in the show are just brilliant in every sense anyway but the band play them incredibly, almost turning the Dominion Theatre into a Rock Arena for the short time you’re in there. Oliver Tompsett plays Galileo at the moment and my god is he brilliant! His vocal are inasne, such an incredible voice and is perfect for the role. He commands the stage and performs the role brilliantly, has to be one of the best Galileos ever. His voice is honestly out of this world! Rachael Wooding returns to the show as Scaramouche having previously played Meat. Her comic timing is fantastic, she delivers the lines flawlessly and even though the role is played almost the same whenever a new actress gets cast in it she really brings a new sass to the role and like Oliver Tompsett her vocals are exceptional. Kevin Kennedy plays Pop in the show and for all the 10 minutes he’s on stage he was alright, nothing majorly impressive and some of his lines he delivers a little strangely and missed quite a few comedy moments which was disappointing but overall he was a good addition to the cast. Alasdair Harvey played Khashoggi well, I can’t say it’s a character I’ve ever actually cared about before but he impressed me. Brenda Edwards wasn’t at this show so we had Sarah Covey in the role of Killer Queen, her voice was filled with power and she actually really looked the part. She really brought out the more powerful side to the Killer Queen rather than a screechy, pitchy, riffy performance which sometimes happens with the role. For someone who is making her West End debut in the show she really seems a lot more experienced than she actually is which is fantastic to watch. Brit is being played by Wayne Robinson and he brings out the cocky side of the character really well and paired with Rachel John’s meat they really have a great relationship on stage which translates really well to an audience. Rachel John’s ‘No-One but you’ was astounding; the emotion she portrayed was really touching. Every audience member couldn’t take their eyes off her throughout that song. The ensemble in the show has to be one of the strongest in the West End, filled with some incredibly talented dancers. ‘On Vision’ was one of the highlights for me, even though it’s obviously a click track the dance in the song was superb and they worked so well together, I couldn’t single out anyone as they were all exceptional! Even though the story of the show is really dreadful, the show as a piece of entertainment is the best thing out there. If you’re looking for a night filled with laughs and good music then this is the show for you, if you’re looking to watch a piece of good theatre that follows theatre practitioners like Stanislavski then please go nowhere the Dominion. Cast Includes: Kevin Kennedy, Alasdair Harvey, Oliver Tompsett, Rachael Wooding, Brenda Edwards, Wayne Robinson, Rachel John, Ross Aldred, Louisa Barratt, Adam Bracegirdle, Harriet Bunton, Sarah Covey, Kristy Cullen, Mark Dugdale, Miriam Elwell-Sutton, Anton Fosh, Ryan Gover, Emma Hatton, Peter Houston, Matt Jones, Kevin McGuire, John McLarnon, Scott Monello, Emma O’ Toole, Katie Paine, Jeremy Taylor, Lindsey Tierney, Catlin Ward, Andrew Simeon, Amanda Ainsley, Charlotte Bull, Matthew Boulton, Phillip Comley, Gemma Marie, Phillip Ovel and Matt Thorpe.